Transcend Quo Vadis Negotiator (English version NEW!!!!). Available First week of March 2018!! 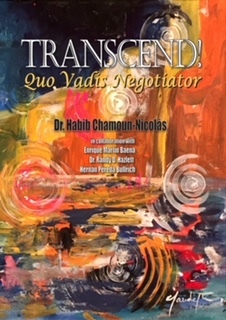 Habib Chamoun has done a remarkable job of creating insights into the ‘soul’ of negotiation, combining perspectives on anthropology, ethics and theology into a new perspective he calls ‘transcendental negotiation’. Readers will find a refreshing perspective on negotiation, not just as technique, but as a way of leading a virtuous life. Habib Chamoun provides a glimpse into the mind of the transcendent negotiator: prudence, justice, temperance, fortitude and discernment play important roles. Since every human interaction implies the possibility of negotiation, he urges us to transcend the transactional, offering an appealing meditation on elements of negotiation practice that are too often overlooked. Every time you negotiate, you define your values. Yes, you seek to advance your own interests—or those of the individuals and organizations you represent. But all the actions you undertake—everything that you do and say— also establish your character. But what (if anything) do you owe the people across the table with whom you negotiate? Must you always be fair? Do you have to be honest? More fundamentally, what is fairness and honesty in negotiation? Dr. Habib Chamoun-Nicolás’s bold and inspiring book Transcend! addresses these challenging questions with wisdom drawn from his own impressive experience and scholarship. He explains how success in negotiation (and in life more generally) requires prudence, justice, fortitude, temperance, and discernment. His groundbreaking book deserves a place of honor on every serious negotiator’s bookshelf. In his previous book Negotiate Like a Phoenician, Professor Habib Chamoun-Nicolas explains how the Phoenicians were known to have been the most successful traders among ancient civilizations thanks to their negotiating skills and methodology. Phoenicians were famous for many inventions, especially for their success in international commerce, and for being the fathers of one of the first successful globalization experiences in history, peacefully becoming the dominant commercial power in the Mediterranean region and far beyond. Professor Chamoun-Nicolas is an expert in international negotiations and in the Phoenician trade history. In his new book Transcend! Professor Chamoun-Nicolas delves into an anthropological aspect of successful negotiators where character is of utmost importance. He dissects the negotiation process and discusses how a negotiator’s character influences negotiations, citing honesty, integrity and justice as the basis for long-term successful negotiations, such as in the international diplomacy arena. Transcend! is a must-read for anyone who wants to be a successful negotiator. Massoud Maalouf, Former Ambassador of Lebanon to Canada, Poland and Chile. Dr. Habib Chamoun-Nicolas has once more performed in this book a truly impressive work. He not only surprises us with his superb and enjoyable style of writing that once you start reading, it is impossible to put down, but also by his profound knowledge of very diverse situations on the subject of negotiation and his very assertive approach to historical recollections. A book written from wisdom, intelligence, joy and kindness. A fascinating reading even for laymen on the subject, as in my case. As usual, Dr. Habib Chamoun Nicolas has provided an extraordinary work on negotiation. This new contribution to the discipline will surely serve all the public: researchers, diplomats, students, experts and practitioners. This brilliantly written book is easy to read and invites the reader who is interested in negotiating to know oneself and learn about each other in order to carry out together a win-win negotiation. Dr. Habib Chamoun-Nicolas and his collaborators offer in Transcend! an ethical way of functioning not only for negotiators, but also for those in any leadership position. The ancient Cardinal Virtues of Justice, Prudence, Temperance, and Fortitude provide the lens through which discerned action occurs that moves beyond the transactional toward the transcendental. Transcend! imparts a vision of collaboration that is co- responsible and will help leaders, including those of religious congregations, be more effective in their functioning. Very Rev. Frank Donio, S.A.C., D.Min. Director Catholic Apostolate Center Washington, D.C.
Habib writes in a friendly tone, just as he teaches his courses and workshops, and splashes his work with anecdotes captivating the reader and immersing him into it to discover and enjoy the depth of the writings. Transcend! Quo Vadis Negotiator presents us with a scheme that goes beyond the win-win. He mentions that if you want to have a negotiation that will endure long term, as did the Phoenicians more than two thousand years, it must be done ethically and in accordance with natural law. Just as important as the result is the way to reach to it. We must know how to discern and exercise the virtues of prudence, justice, fortitude and temperance, opposing the ego, hypocrisy, arrogance and envy. Chamoun-Nicolas shows us that trust and active listening are important, while distrust and intrigue are cancers of negotiation. The book reminds us that the person is worthy for what he is, and not for what he has nor for what he does. Being a good negotiator is to connect with yourself and to find out the meaning of your actions. Every human relationship involves a negotiation, therefore I consider Transcend! Quo Vadis Negotiator essential reading. Dr. Chamoun's book Transcend! Quo Vadis Negotiator is written in a deep and profound humanistic and spiritual style. The great experiences inside the book are entertaining and funny, making the readers to connect and to look back at the stories. The business-based success stories are the heart in Transcend! Quo Vadis Negotiator, with the author succeeding to open first with the cardinal virtues to make it wide and transcendental. This book offers an anthropological perspective on negotiation, focusing on the important moral dimension of negotiators. Incorporating examples from historical and religious texts, along with anecdotes from his own life, Chamoun-Nicolas draws readers into his reflections on negotiation through the ages as he highlights the ethical principles of a successful negotiator. I have always believed that any change starts within; what is surrounding us is a reflection of what we think, say, do and fail to do. Everything has an impact on our environment, hence the importance of considering what the book Transcend! reminds us not only to achieve successful negotiations, but above all to be happier: the importance of learning to discern and choose correctly, be aware that we are what we repeatedly do, and the possibility of becoming extraordinary people depending on our choice. For me, freedom is the master key to all our possibilities and all our creations. The challenge is to understand that freedom and responsibility are two sides of the same coin. To be free and choose correctly, it is imperative that we are responsible for our words and actions. As stated in these pages, the first responsibility we must assume is to know ourselves to meet our own self, our essence, then connect with others and achieve prosperity. In the end, the only way to transcend is to distinguish between what feeds the ephemeral and what helps to build the eternal. We learned that where our treasure is, there is our heart. Let us not miss the opportunity to live intensely every day with great passion, transmitting that enthusiasm to everyone we meet on the road, whether in negotiations or in another context. Truth, love and defending freedom is the calling that we all share. Let us make the right decisions; we are still on time. Daily life is a continuous act of negotiating, at home, in the office, while shopping or in public life. There are those who have not developed this ability to negotiate, and not all the ways to negotiate are the same. In today's society, dominated by increasingly sophisticated forms of selfishness, you think about wanting to negotiate only with the objective to optimize the personal benefit, which ends up in increasingly poor human relations, where there is mistrust, abuse or indifference. The great merit of this book is precisely that the author invites us to transcend in the negotiation. Contemporary society needs women and men who are great negotiators, who know how to manage the great values of justice, solidarity, truth or beauty, not encountering any objection to do good, do well, and always do the best possible. There are many frustrated lives living in deprivation, bitterness, sadness or loneliness for not knowing how to cultivate the art of negotiation, to transcend inside and outside the family, not wanting to demonstrate in practice the human capacity to seek happiness in the good of others, in order to experience an "I love you, I want your good, I want the best for you." In its pages of history and illustrative and entertaining anecdotes, Transcends! Quo Vadis Negotiator makes the ideal of virtue and the good life, reminding us what it takes to build the civilization of love. Coming Soon New Book in English "Transcend Quo Vadis Negotiator"
Copyright © 2016 KeyNegotiations All Rights Reserved. For any questions please contact us.